What Kind of Sempervivum Is This? There are thousands of different varieties of hens and chicks plants. You will be amazed at how unique they all are, from the coloring to the shape, growth habit and size. They change often throughout the year, altering their shades and hues depending on if they're in full sun, or partial shade. The soil they grow in has a huge impact on them, making them grow faster or slower, sometimes in weird and fantastical ways. They show different characteristics when young, metamorphosing in to their adult forms at various ages. 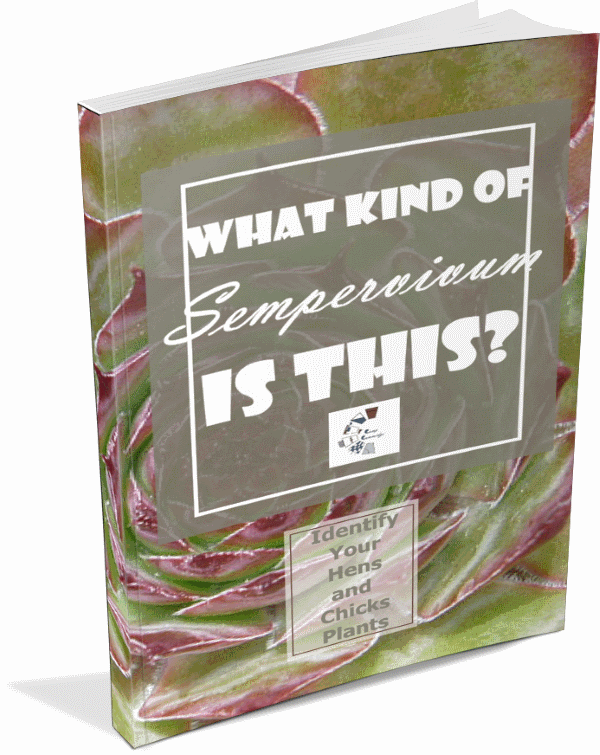 This e-book shows a fraction of these beautiful plants at their best, grown in my succulent nursery. With over 120 different ones shown here, that's just the tip of the iceberg, and many professional growers will tell you that it's impossible to identify a plant that you get as a NOID (NO IDentity) from a friend or neighbor. It doesn't hurt to try though! There are thousands of different types of succulents; short and compact, slender leaved and single rosettes, chubby tightly packed clumps, more than you can imagine. Let me show you a few of what I've grown in my nursery.